On Monday morning, when I heard the news that David Bowie had died of cancer, my immediate reaction was not sadness or grief. I just didn’t believe it. This wasn’t because I deemed the man to be immortal or anything. It was mostly about the release of his new album only three days before. If it had been an accident, a sudden death, that juxtaposition of creativity and death might have been possible but not this. How could someone be so productive, so vibrant, so artistic on one day and then be gone on the next? It just didn’t compute. But, of course, it was true and the outpouring of love and respect that has come out from the world in these subsequent days has really been something to see. It was not totally unexpected either, to see a sort of mini-backlash against all the people who felt so sad. It is in the nature of modern media to react to news and then react to the reaction. Some people thought it unseemly for so much apparent grief to be expressed over the loss of someone who was not family, who was not a friend, who we didn’t know. I think those people missed the point but then it’s a lesson you have to learn rather than one you can be told. We don’t grieve people simply because they were family or because they were a friend of ours. We naturally grieve those few people who actually manage to touch our hearts. And they can touch it from an arm's length away or across an entire universe, the effect is exactly the same. Our hearts have been touched. It might be a writer or a film actor or a popular singer, it doesn’t matter. When our hearts get touched, they stay touched and when that person who touched them goes away, they are going to leave a dull and a hollow place behind them. I was not the biggest David Bowie fan ever. I liked and greatly admired much of his music and it was a part of my growing up and my life. But, somewhere along the line, he must have touched my heart, because I feel his loss even though I never met him. There is a person who has touched me very greatly with his music and his artistry and I won’t say his name here lest I bring the attention of some ironic power onto him. When he goes, and I hope it’s not for a long time, I will feel it. I will feel it as many of you have felt it for David Bowie and for Alan Rickman and for all those other people who have gone before. Give me a bit of space to be sad when that happens just like I will gladly give you a bit of space now. Because, as a man called Tom Jones (not that one) once wrote. I think my first reaction, too, Ken, was that it might be a hoax. One day the world will end and there will be those of us who’ll turn on the BBC to see if it’s really so. (If you can’t trust the BBC, well…) And then Alan Rickman! Both sixty-nine too. Carrie noted—with a smidge less humour than is normally typical of her—she is also due to reach sixty-nine this year. Now I find myself wishing for the death of some anonymous (and probably very nice) sixty-nine-year-old so the rule of three is satisfied and we can breathe again. 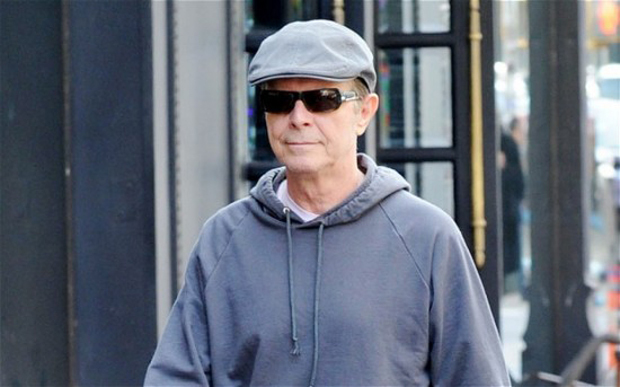 Bowie’s death hit my wife quite badly; she burst into tears on me over the phone the next day. She’s in America again to see to the interment of her father’s ashes and so I suppose any death was likely to set her off. I cried too the day before. I’d saved a programme to watch, ‘The Genius of David Bowie’, which turned out to be nothing more than a collection of old videos but it was appropriate and just what I needed. I was fine until the opening bars of ‘Heroes’ but then I’ve always found it an emotionally-charged song. I’m afraid the loss of Alan Rickman had little effect on me. I watched A Little Chaos that night and delighted in his performance but that was it. Like you I’ve noted the incredible response to Bowie’s death. The only thing in my lifetime I can compare it to is the death of Diana, Princess of Wales. She was another person none of us knew and yet her passing (for some inexplicable reason) really seemed to touch people. I imagine the death of Kennedy must’ve been like that. Of the three his is probably the worst because it wasn’t an accident or illness, it was murder; it wasn’t his time. Of course in many respects David Bowie’s time was already up. Many thought he’d retired and we didn’t mind that. He’d had a good run as they say. And then The Next Day arrived in 2013 and that was very nice but surely that was it. No one expected Blackstar but the feeling when it did arrive was that he’d entered a new phase which we expected to go on. And then he goes and dies. As if he could’ve planned it almost. I remember reading about Marilyn Monroe years back, a quote from Henry Miller, but I can’t find it. The gist of it was an acknowledgement that there were two Marilyns, the woman he married and the myth and the myth wasn’t his; it had a life of its own. Marilyn herself said, “I’ve never fooled anyone. I’ve let people fool themselves. They didn’t bother to find out who and what I was. Instead they would invent a character for me. I wouldn’t argue with them. They were obviously loving somebody I wasn’t.” I think much the same is true with not just Bowie but all our heroes. David Bowie was not David Jones any more than Marilyn Monroe was Norma Jeane Mortenson. David Bowie is an assemblage. In years to come there will have been so many stories told that no one will know the truth; he will have transcended truth. It happened to Elvis. It’s not a bad thing. People need myths more than they need truths. Truths are mostly disappointing. David Bowie is a part of me, not a significant part but a part nevertheless, and so I’ve every right to add to the myth. He added to me. Not in a huge way but in a way. When I search for inspiration he’s there in the back of my head; lines from his songs are all there in the muddle. I stuck with him up until the eighties—the last album I really loved was Scary Monsters (And Super Creeps)—but I was always interested to see what he was up to. I never ever thought he was past it; he’d just entered a phase that didn’t quite connect with me and in time he’d move on. Tin Machine, for example, was an album I listened to over and over again. The single of ‘Hallo, Spaceboy’ (remixed by the Pet Shop Boys) was a delight. And ‘Blackstar’ will follow on from songs like ‘American Pie’ and ‘I Am the Walrus’ with everyone having their thoughts as to the “true” meaning. Hi Jim, I had contemplated letting the blog posts slide for a while and pushing harder on some other writing I'm doing. One of the things which brought me back is the truthfulness and candour which you so often leave, here in the comments section. Nicely put, Ken. When my other half told me David Bowie was dead, my response was "No he isn't!" I admit was never a big fan of Bowie (as a young child I was actually scared of him!) and I don't own any of his records. But somehow, I know the words to many of his songs; I heard "Life on Mars" in a cafe only a few weeks ago, and it brought a lump to my throat. He was a part of our lives whether we realized it or not. And somewhere in my mind, where nostalgia lives, a little voice whispered,"This is what happens when you grow up. People you admire age. Then they die. And a little piece of your childhood goes away with them." This morning, I heard Glenn Fry of The Eagles had passed on...at 67. Another piece of my teen years sighed out loud...and sang the blues.